Anthony Watts has been acting even more oddly than usual lately. A bit off kilter even for him. He has just posted a graphic confirming how fake skeptics view surface temperatures. His graphic was a little smudged, but here it is. He says the blue bit is how he and other fake skeptics view surface temperature, writing "what the climate actually does". Thus confirming what SkepticalScience portrayed in the "escalator". The other odd thing is that he seems to think that 'alarmists' see the global warming temperatures as the red line above, even though he specifically refers to the SkepticalScience 'escalator'. What do you reckon? Did his Wacom not work properly or does he need spectacles? 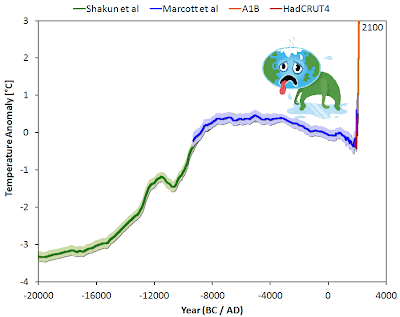 Also weird, the attribution of the new graph (bottom right) is still SkepticalScience.com. Is that libel? He also tagged it satire. But you wouldn't know it from the comments. "Skeptics" have every bit as much trouble with humour as they do with facts, hence the success of the execrable Josh. It may not be technically right, Sou, but to Anthony and his readers it feels right. That's all that matters. It's just a bit of chum to keep the faith going that little bit longer. When the dust has settled over the debate and major conferences on the psychology - and outright mass-psychosis - of denial have passed into history, one inexplicable core mystery will still remain. How did anyone ever manage to find those Josh cartoons funny? Is this another example of Pat Michaels' notion of 'funsies'? Err... the red line in Watts' graph is what alarmists predict the temperature will do not a trend line, I guess you missed that bit. Oh well let's not let facts get in the way of some good alarmism. 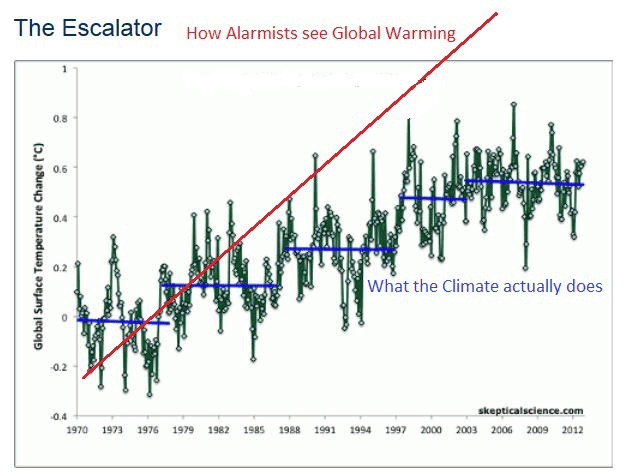 I wrote in the article: "The other odd thing is that he seems to think that 'alarmists' see the global warming temperatures as the red line above, even though he specifically refers to the SkepticalScience 'escalator'." "You can see where the red line is and it shows just how badly his hand slipped (or how bad his eyesight has become)"
You are comparing two different things, but let's face it, that is typical alarmist behavior. No, I'm talking about exactly the same thing. 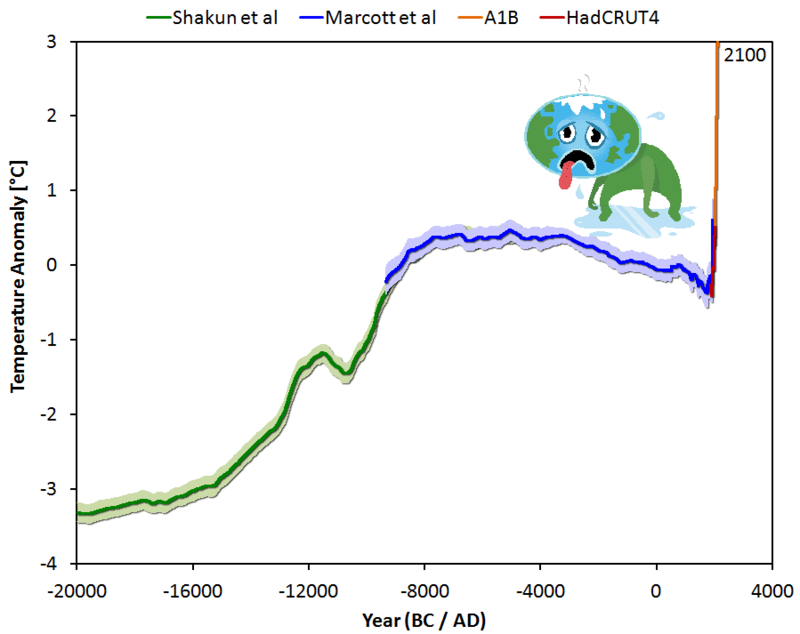 It's only in your mind (and maybe Anthony's and others like him) that you think the first red line is "how "alarmists" view global warming". In the real world I know of no what you call "alarmists" who would think that average global surface temperatures would have risen by 1.5 degrees Celsius or more between 1970 and 2006 or so.